Kinetic Inventory Management for osCommerce gives you the ability to easily create automated purchase orders for one or more vendors at a time. You no longer need to create Excel spreadsheets or manually fill out forms for the PO's you send to your vendors. Instead, you can focus your energies on other aspects of running your business. The software is set up by default to create individual purchase orders for all of your suppliers at once, but you can easily choose to work with only the vendors you select by clicking on 'Remove [vendor name]' at the top of the page until you are left with only those you wish to generate PO's for at that time. On the screen below, we have chosen to create a purchase order from ACME only at the moment. All products from all of the suppliers you deselect will then be removed from the spreadsheet table so you can focus on only the products you wish to order. After reviewing and/or adjusting the 'To Be Ordered' quantities on the Create Purchase Orders page, all you need to do is double click on the 'Create POs' button and the system will automatically generate a neatly formatted purchase order that is ready to fax or send via e-mail in PDF format. 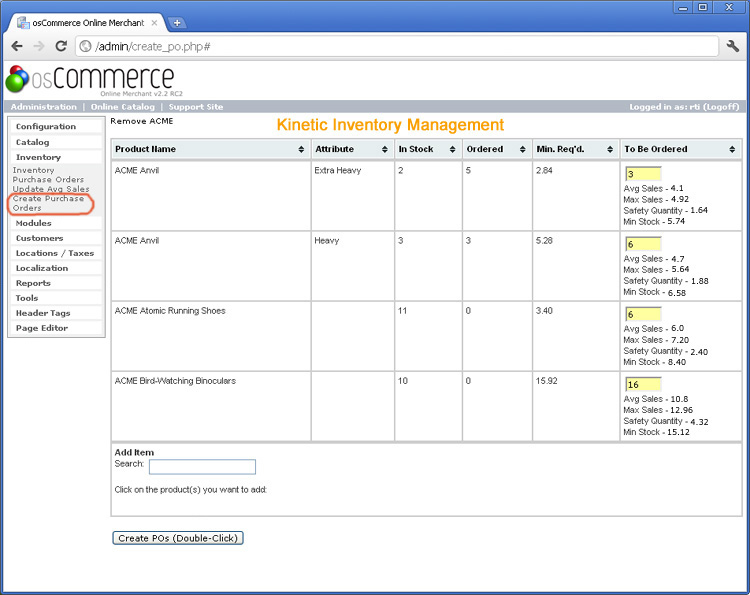 An example PO created by Kinetic Inventory Management is shown below. 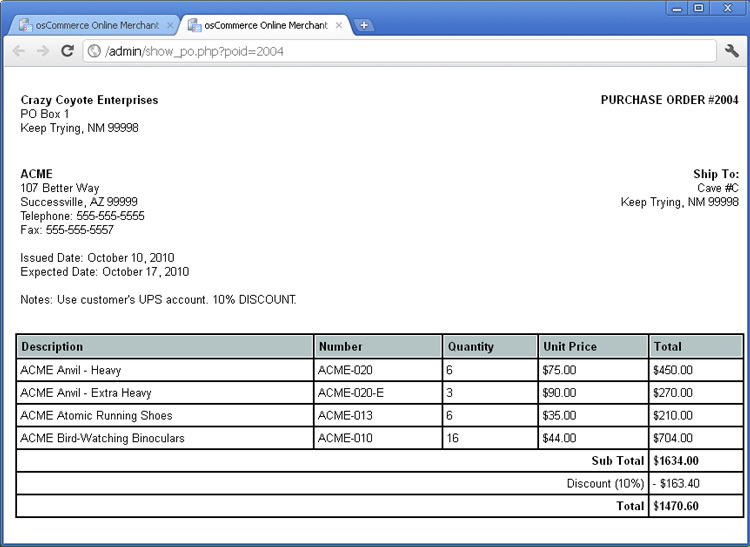 OsCommerce just opens up a new window for you that allows you to print the purchase order on a "clean sheet" without any menu items and formatted to fit on standard 8 1/2" x 11" paper. Now that you've created your new PO and sent it to your vendor, the next step is to manage your inventory order when it arrives. The next article describes how you can receive and check in your inventory with very little effort.